Duryodhan plans to visit the Pandavas during their exile and humiliate them. But he gets embroiled in a battle with the Gandharvas and is captured by the Gandharva King Chitrasena. 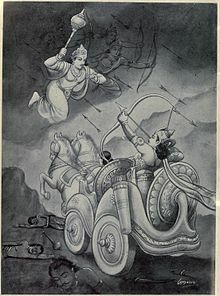 At the request of their brother Yudhistir, Arjuna and Bheem fights the Gandharvas and rescues Duryodhan and his family. Humiliated by this magnanimous gesture of the Pandavas, Duryodhan returns to Hastinapur. Listen to this episode which marks a turning point in the story of Mahabharata.